We talk mostly in our blog about the most trending furniture and interior style, which are modern and Scandinavian. However, let's not forget that there is a style that is always on trend, never outdated and has its admirers. As you guessed probably, it is the traditional style. People love this kind of interior for many reasons. It creates a calm atmosphere and avoids wild or chaotic elements. Although the furniture might feel outdated, it is still classic and consistent, consists of matching pieces. Places in traditional design feel convenient for every age group since it delivers a familiar look. You cannot see modern piece furniture or another element in such an atmosphere. Although the traditional style is usual to most of us, it is not as easy as thought to design the places in the mentioned approach. If you want to apply the traditional style to your accommodation, we will help you with this. This time we are going to talk about how to decorate the dining rooms in classic style. Firstly, we need to know the main elements of the traditional design. 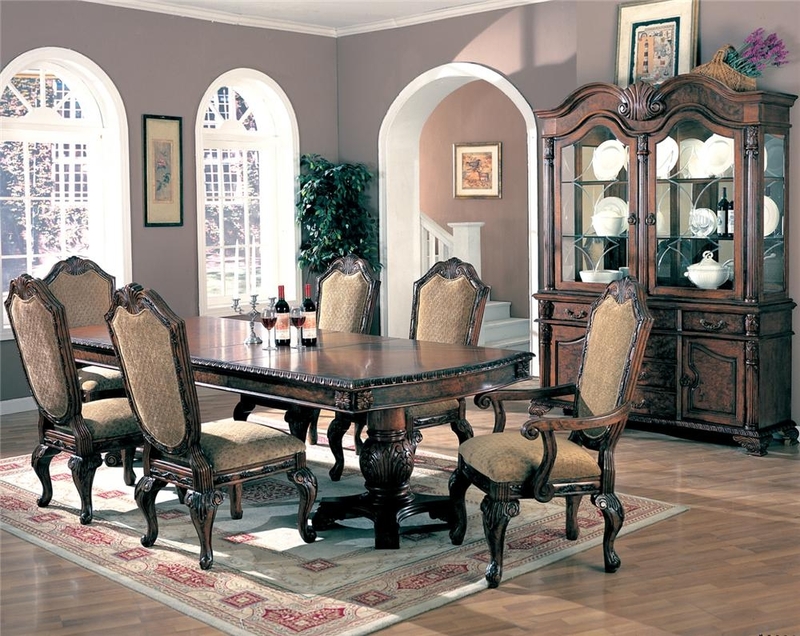 Traditional dining rooms usually use mid-range tones. It is also possible to observe very light & very dark colour in the place. Often you can see a bright colour used on the walls, while the darker tones of it will appear in furniture, upholstery or flooring. Keep in mind to avoid very bright combinations once you decide to go for classical style. 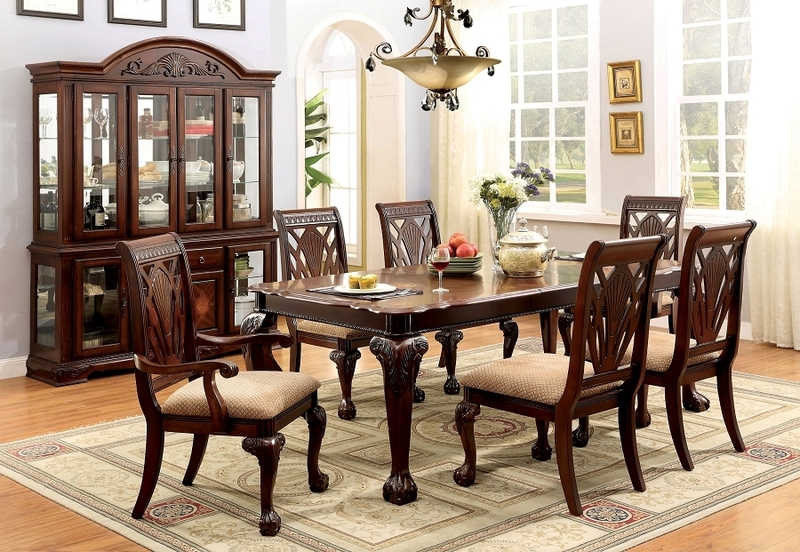 Dining room furniture includes upholstery mainly on dining chairs that is not too shiny or textured. Florals, patterns and geometrics illustrated on upholstery are of the most common details about the design. Furnishing is the central part of creating the desired atmosphere. The furniture like dining table can have a mixture of curved and straight lines. When it comes to the colour of the wood, you can see the darker shades being mostly used. However, lighter shades are also part of classic style and added to the interior very commonly. The other furniture items like a sideboard, buffet, or china cabinet are placed in one wall in the classic style dining room. These pieces' colours should match and be in harmony with the dining table and chairs set. Accessories play an essential role in traditional style dining rooms as well. A rug is one of such favourite accessories placed under the dining table for 8. The important detail here is that the accessories mostly appear in pairs. To decorate the traditional style dining room you can use a symmetrically balanced pair of lamps, plants, mirrors, vases. Books collections are also one of the standard choices. Talking about other details like ceilings, window covering, they also reflect the classic vibes. Generally, traditional dining rooms use mix vertical and horizontal lines. It is possible to see gentle curves in different elements like furniture and accessories. All these details create a homey, calm and convenient atmosphere. You can see from the photos the delightful interior combinations in the traditional style. If you are also one of the admirers of the design, our online store can help you in this. 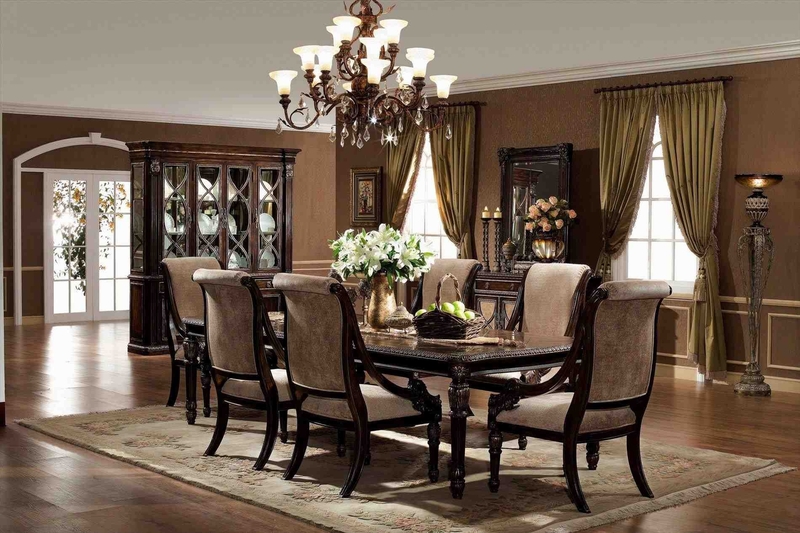 We have a large catalogue of dining room furniture that will turn your place into a serene place and please you.